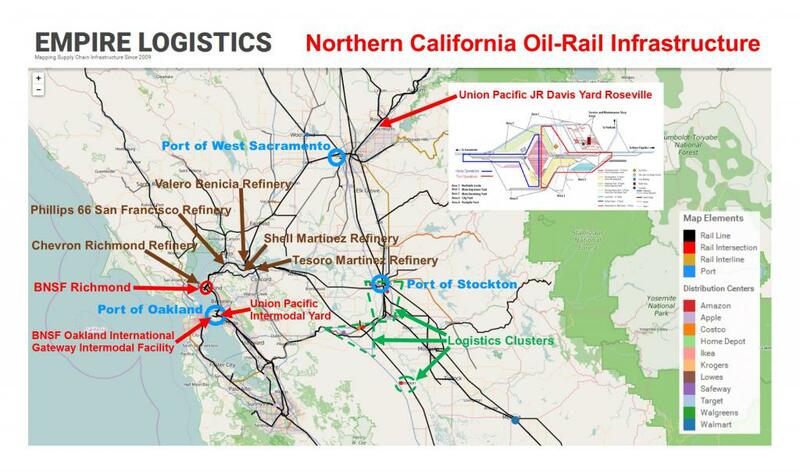 On 14 March 2015, two dozen rank-and-file railroad workers, as well as nine refinery workers who had recently been on strike, gathered in Richmond, California for a conference with the purpose of building bridges with ecologists, especially given the recent spate of oil train derailments and explosions. Speaking only for myself and only for the event in Richmond, California, it was a pretty amazing convergence of industrial workers from various nodes on the energy supply chain -- with some very insightful discussion and tentative proposals for possible future collaborations. There were 25 railroaders in attendance (a couple of whom are retired), from all over the U.S. (e.g., Northern California, Georgia, Illinois, Iowa, Kentucky, Nebraska, Nevada, New York, Utah and Washington), representing engineers, conductors, and a machinist on the four major U.S. Class I railroads (BNSF, CSX, NS, UP), as well as on Amtrak. There were 9 refinery workers, which included a carload of 4 who drove 400 miles from the Tesoro Refinery in Carson, CA to attend the conference. The others were most from the nearby Tesoro plant in Martinez. All these previously striking fellow workers were acknowledged as the proceeding began. There were ILWU longshore workers from Seattle and the Bay Area. There were a handful of maritime workers from IBU-ILWU in the Bay. There were a few other industrial workers, from various sectors like electricians and power plant workers. There were a couple first responders, but it was unclear whether they worked in the public sector or for private companies. Most of the rest identified as environmentalists or concerned citizens, regardless of how they sell their labor power (or sold it, as a few were retired). One oil extraction worker from Alberta, active in indigenous struggles in Canada, came to Richmond and later headed to the Olympia conference. Altogether, about 125 people attended the conference and during the introductory session came up with goals around building solidarity between supply chain workers and communities affected by the transportation of hazardous materials (the list of which goes well beyond fossil fuels, to include highly toxic chemicals like chlorine, fracking component Beta Pikaline, Hydrogen Cyanide, etc., etc.). During the introduction a railroad militant gave an explanation of why Railroad Workers United exists, a brief history of North American rail labor, and a short account of the recent victory against the single employee crew tentative agreement -- which received a standing ovation. It closed with an appeal for RWU to take the offensive in the fight for safety together with communities along the rails. The last one, #6 was a mistake because it broke down into a near argument about consumption, with many of the liberal environmentalists wanting to reduce the whole production chain down to a question of consumer choice. Thankfully an Empire Logistics presenter foreclosed a debate and assigned one sector to groups of 2 tables. 1. What role does your sector play in the energy supply chain and how does that affect the impact of your proposed action? a. What are the strengths of your location in the chain that can maximize the effectiveness of solidarity actions? 2. What information do you need to plan and execute your action? 3. How does your sector overlap with other sectors to possibly draw them into a larger action? a. Give examples of ways your action could involve other sectors? 4. What actions can you do that stay within the constraints of the law? a. What are the risks of going beyond the law? What could make them worth the risk? 5. What should outsiders (“the community”) know about your sector in order to support your struggle and take actions in solidarity with your action? Most of the conference attendees were game for such a brainstorming activity, but as mentioned before some more mainstream environmentalists had never thought in systematic terms, let alone tracing any commodity back to the point of extraction, processing, production, or even transportation. Some got it and it seemed like an light bulb went off in their heads. They eagerly wanted to report-back with their new insights at the end to the entire assembly. Parts of the process were magic. It was a pretty amazing activity, despite our crew not being prepared for such a large crowd. Should we do the workshop again, we will give much a much clearer explanation of how our goal was to brainstorm innovative tactics of cross-sectoral solidarity, as well as the fundamentals of how an energy supply chains functions, from extraction through a variety of processes to consumption. Some of the other workshops later in the day were on "Solutionary Rail," a proposal for electrifying rail lines in the Pacific Northwest, as well as Environmentalism 101 and Political Ecology 101. Empire Logistics co-facilitated the latter and guided into more breakout groups to discuss possible collaborations between workers in struggle and ecologists. The latter was set-up with brief overviews of the alliance created when Judi Bari from Earth First! helped organize a timber worker local of the IWW in 1989. Other examples were given of workers preventing the demolition by explosives of Candlestick Stadium in San Francisco, providing work for a slower process of non-toxic removal of the entire structure. Again, breakout groups pondered ways to bridge the working class and environmental concerns, with mixed inspiring and disappointing results. Right before dinner, we created four affinity circles to discuss possibly building a network around railroad workers and affected communities, as well as strengthening connections made during previous workshops. The first two were quite fruitful discussions, with many connections made for possible future working class collaborations. The latter two were kinda duds, dominated by mainstream activists who want to write letters and lobby elected officials, as well as stay fixated about "dirty" commodities, but only from the point of consumption -- the gist of the conference not having had the slightest influence on a tiny minority of these hardened liberals. But the most inspiring result was the initiative from the indigenous oil extraction worker from Alberta, Canada. No sooner was the conference over, than he was calling his contacts in Lac-Mégantic proposing doing a similar conference there. Other suggestions were Chicago, Los Angeles, Houston -- and any other place where there's a confluence of energy supply chain workers and physical infrastructure, meaning rail, ports and refineries. The first convention was amazing! It takes me a long time to write.. So I make my report video here.. Frankly I found this guy creepy. Very NGO-ish, arguing that we should fight for "public-privater" partnerships, appealing to capitalists such as Warren Buffet. The argument? The workers and the bosses have nothing in common except when it comes to the environment. In that case we can rely on "public-private" partnerships facilitated by the bourgeois state. It's a reformist-non-profit-neo-liberal pipedream, which pitches this mainstream activismist groups' proposal for an impossible neo-Keynesian fantasy, selling itself to both labor and corporate investors with the promise of "green jobs." Lots of parallels to the nutjobs who call for a green new-New Deal. The electric rail proposal is no different than the corporate strategy of Mark Tercek, who presently runs the Nature Conservancy. See this interesting article, called "Green is Good: The Nature Conservancy wants to persuade big bigness to save the environment," in the May 12, 2014 New Yorker.